ENNIS, Texas – Primed to make a move in the hunt for his first career world championship, Hector Arana Jr. did not have the result he had hoped for during the most recent race of the NHRA Mello Yello Drag Racing Series Countdown to the Championship. But despite the disappointing finish, the Pro Stock Motorcycle standout insists there is still plenty of fight left on his team with three races remaining. Arana lost in the first round at St. Louis, dropping him 115 points behind category leader Eddie Krawiec. 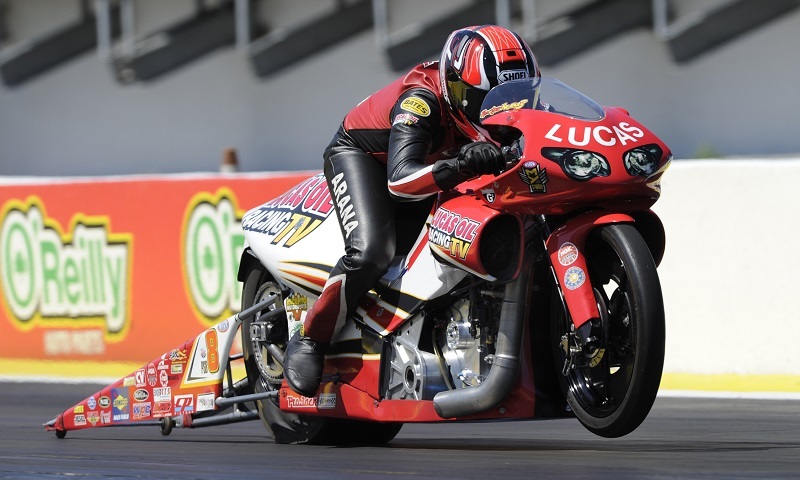 It wasn’t the situation Arana had in mind heading to this weekend’s AAA Texas NHRA FallNationals at the Texas Motorplex, but he believes there is still enough time to make things interesting on his Lucas Oil Buell. Dallas marks the fourth event in the NHRA’s six-race playoffs and with the NHRA Mello Yello Drag Racing Series season coming to a close, Arana hopes to have a noticeable impact on how things finish. Back-to-back semifinal appearances to open the Countdown to the Championship marked a solid start, and had Arana third before the early exit in St. Louis. But after three runner-ups in 2017 and no wins since the 2015 season, Arana is looking for more than just solid finishes. He’s anxious to return to the winner’s circle and outlined the approach to get there this weekend in Dallas. Arana believes the team has figured out the solution to what went wrong in St. Louis, thanks to plenty of hours of work from his dad and PSM teammate Hector Arana Sr.
With that in mind, the first-round loss, Arana Jr.’s first since April, is in his rearview mirror, though plenty of strong challenges remain this weekend. LE Tonglet won in St. Louis to pull within 16 points of Krawiec, while Hines jumped to third and sits 72 points back. Reigning world champion Jerry Savoie is just two points back of Arana, meaning it was important that Arana got everything solved before this weekend.